We're pretty used to our instantaneous communications these days, aren't we? We get mad when an email takes too long to send or if a page takes more than five seconds to load. 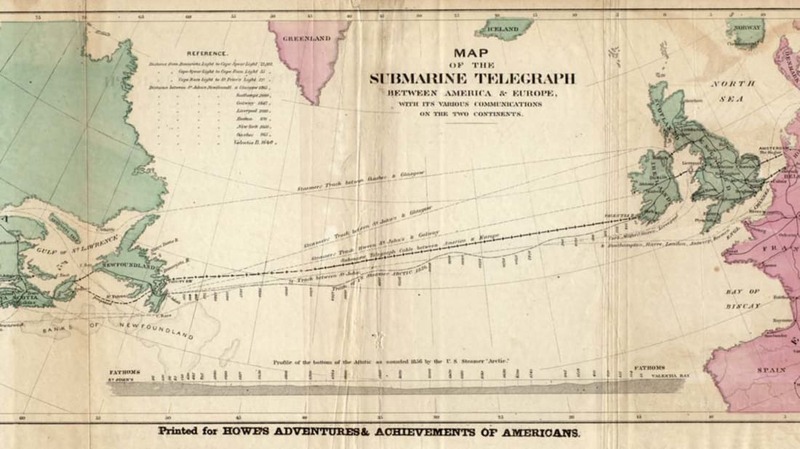 Back in the 1850s, though, people were awed and amazed when the first communication was successfully transmitted via the Transatlantic Cable in a mere 17 hours. Yes, you read that right - a 98-word message from Queen Victoria to President James Buchanan took the better part of a day to send. Considering that the same message would have taken about 12 days by ship before, 17 hours was still pretty impressive for the time. "it is a triumph more glorious, because far more useful to mankind, than was ever won by conqueror on the field of battle. May the Atlantic telegraph, under the blessing of heaven, prove to be a bond of perpetual peace and friendship between the kindred nations, and an instrument destined by Divine Providence to diffuse religion, civilization, liberty, and law throughout the world." Yep, there was a lot of pomp and circumstance and general goodwill around the whole affair... so imagine being the guy who destroyed the cable just three weeks later. That guy was Edward Orange Wildman Whitehouse, the chief electrician of the Transatlantic Cable. In an attempt to boost the speed at which messages were transmitted (see, we've never been happy with how fast things run), Whitehouse boosted the voltage from 600V to 2000V, frying the insulation. It wasn't easy getting that cable successfully installed - it broke several times - and it wasn't easy replacing it, either. The replacement didn't arrive for more than six years. An investigation took place to definitively determine if it was Whitehouse's actions that caused the cable to croak; the study decided he was guilty. Since then, experts have suggested that many other factors would have resulted in the cable's premature death anyway - Whitehouse may have just sped things along a little. Nevertheless, his reputation was damaged and he was forever known as the guy who screwed up the world's amazing communications system. Just a little something to think about the next time you're waiting for LOLcats to load.